The most useful and up-to-date map of Milan’s large public transport network of buses, trams, metro trains and trolley buses is the interactive map and journey planner on the site of the local transport operator, ATM. 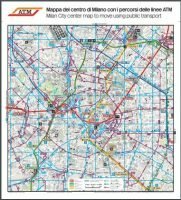 The site also has a pdf street map of central Milan’s public transport network. (Click the thumbnail map below.) Unfortunately, it hasn’t been updated for a few years, but new paper copies covering a much larger area can be purchased at Centrale, Duomo, Loreto, and Garibaldi stations in Milan. That map also shows stops for express airport buses and trains.